Kentucky is home to a sizeable and growing Amish population. Amish did not arrive to the state until the mid-20th century. Since that time the Amish population has rocketed to become the 8th-largest in North America. Today, around 8,000 Amish (62 church districts) are found in 30+ settlements (Young Center 2010). Munfordville/Horse Cave-The Munfordville community is the largest in Kentucky, and one of the fastest-growing in the nation. The Amish settlement in Hart County, found near the towns of Munfordville and Horse Cave, was started in 1989. This community has ties with the Geauga County Amish settlement in Ohio. The Munfordville settlement has grown rapidly over the past two decades, and numbered 13 church districts as of 2010 (about 1,600 people). In comparison, another community founded the same year in Christian County, KY, is less than half the size. Munfordville has benefited from a high level of in-migration of Amish from other communities, including its large parent settlement of Geauga County (note: though Munfordville is used to describe this community, there are no Amish actually in the town, it simply refers to one of the most common mailing addresses for area Amish). Amish at Munfordville operate small businesses and farm. The hilly terrain is not the best farmland, but Amish do operate traditional farms as well as grow produce. The local produce auction runs on weekdays at 1pm. A number of shops, including furniture businesses and retail stores provide ways of making a living for the Amish (more on Kentucky Amish furniture). Detweiler’s Country Store, near Cub Run, is a well-known variety store with gardening amenities, books, foods, and dry goods. 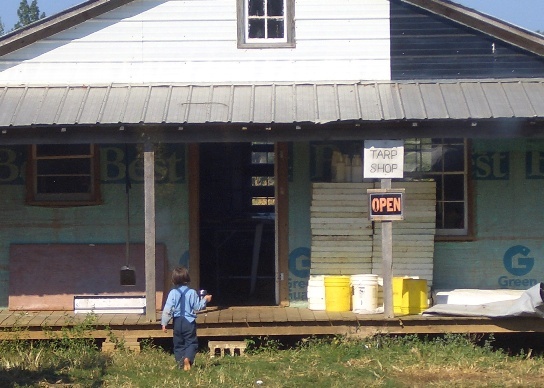 Amish-run sawmills and fabric shops can be found dotted among the Hart County hills as well. Traveling in Hart County by buggy can be hazardous. Like the Amish community at Holmes County, Ohio, Hart County is hilly. In some places you will find buggy pull-off lanes, usually on steep hills, which provide a shoulder for buggies to pull over and allow vehicles traveling behind to pass. Read more on the Munfordville, KY Amish. The lands near Guthrie in Todd County are home to an unusual community of “electric” New Order Amish. New Order Amish on the whole make up only a small minority within Amish society. Though they dress plain, use the horse-and-buggy, and speak Pennsylvania Dutch, New Order Amish in general differ somewhat from Old Order Amish. New Order Amish tend to have a greater focus on missions and outreach, are generally liberal on technology, believe in assurance of salvation. Some groups also hold Sunday School. New Order Amish are themselves divided into two groups: “electric” and “non-electric”. Electric New Order Amish differ from non-electric New Orders in that they permit electricity to be used in the home. Guthrie Amish are also very progressive when it comes to tractor usage. Tractors are driven on the road; most Amish homes can be identified by the bright blue or red tractor parked outside. 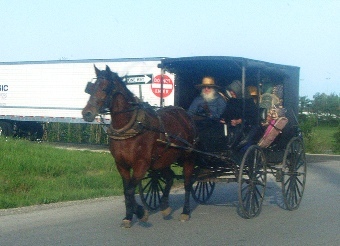 Buggy usage is limited compared to other Amish settlements. As a result, Guthrie homes are more spread out than one might expect for a settlement of this size. The Guthrie community is the oldest in Kentucky, founded in 1958. Today it numbers just 3 church districts in size. Guthrie Amish originate from a now-defunct Amish church at Stuarts Draft, Virginia (GC Waldrep, “The New Order Amish and Para-Amish Groups”, Mennonite Quarterly Review July 2008 p. 399). 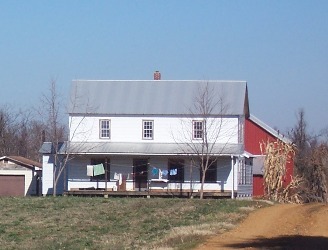 Guthrie Amish maintain ties with other communities, such as the electric New Order Amish church at Union Grove in North Carolina. Christian County is home to 2 Amish settlements: the second-oldest in the state, near Crofton (founded 1972, 2 church districts), and a newer and larger settlement near Hopkinsville and Pembroke (1989, at 5 districts the state’s second-largest). Crofton is an electric New Order settlement, of similar size to that at Guthrie in neighboring Todd County (see Guthrie Amish above). Christian County, along with Todd County, is also home to a community of Old Order Mennonites. Todd County is also home to a sizeable produce auction (Fairview, at Elkton) where both Amish and Mennonites sell their fruits and vegetables. Numerous smaller settlements are found across the state. Marion in Crittenden County is home to the third-oldest Kentucky settlement, founded in 1977 and with 4 church districts today. Barren County is home to a pair of settlements founded in the 80s. In addition to Guthrie and Crofton, a third, smaller electric New Order settlement can be found at Princeton in Caldwell County. On the other end of the spectrum, Kentucky is also home to a few ultraconservative Swartzentruber Amish settlements, one found in Hardin County near Sonora, and a second in Graves County near Mayfield. Other Kentucky counties with Amish settlements include Lincoln, Logan, Fleming, Casey, and Breckinridge Counties. With its wide range of affiliations, Kentucky is a state which showcases the diversity of Amish society (see David Luthy, Amish Settlements Across America: 2008). All Kentucky Amish settlements except for the Guthrie community have been founded during the last 40 years. Kentucky’s attractive location and relatively low land prices have led large numbers of Amish to settle the state. According to the Young Center for Anabaptist and Pietist Studies, Kentucky has been the fastest-growing state of Amish populations of significant size. Between 1991 and 2010, the Kentucky Amish population grew by 226%. This is in large part due to high in-migration, which has continued at a high rate in recent years. You still need Amish Workers? As a hobby, I travel out to meet the scribes for the Amish newspapers The Budget & Die Botschaft. I plan to take a trip to Kentucky in 9 days to meet some of them. The problem is I don’t have an Amish directory for Kentucky. (like I do for a number of other states) Would anyone that reads this forum happen to have one? My hopes are to ask you to help me look up a couple of the scribe address’s to make it easier to get to them. Once I meet them I am sure I can either buy a directory or at least look at theirs for my next stop. Please either respond here or feel free to email me at my address below. I plan to leave 12-18-14. Thanks for your help! Do you still need this info about Budget scribes in Ky? If so, I have at least two names and addresses to send you. I tried to send it to your email listed, but it came back undeliverable, so please post your current email if you want me to send you that info. Also, I have found that the book, Who is Who in the Budget to be a good source for such info. I believe the book costs about $10 at the present time, and it can be obtained from The Budget office at Sugarcreek. Hi, I am looking for an Amish Roofer to give me a quote on a metal roof for a home in the Bedford KY area. Home was built in the early 1900’s. I have some work to be done near Guthrie Ky. How can I contact the Amish Community there? I was in Scottsville, Ky today to get some produce. Was told of a couple small Amish produce stands close to TN state line I believe around Celina, TN. Can you tell me where these two / three produce places are and what town they are close to? Thanks. I have just purchased a farm in Henry county north of Franklinton and I need a bedroom & bathroom addition put on the house and some remodel on the kitchen and living room. I also have two metal barns that need painting and some touch up inside and an old tobacco that needs some shoring up and roof repair. Does anyone know of some Amish craftsman in the area I could contact to help with this? Call Roman Raber at the Farmstead Market and see if Marlin Miller is available. Marlin is a contractor in Defoe but said he had a lot of contract work already in progress as of this week. Worth a try! Franklinton is not far from Pleasureville, where there is a small, rather new Amish community. Have you contacted the Amish at The Farmstead Market at Pleasureville? They may know of someone in their Amish community, or other Amish carpenters, who may be able to do the work you need. Their phone number is 502-878-4211. There also is an Amish restaurant in Pleasureville, and the Amish who operate the restaurant may be able to help you out. I can’t remember the restaurant’s name, but the Raber’s at Farmstead Market could tell you. I haven’t been out to Pleasureville since Jan. 2016, but I think the Market (which is in the country) and the restaurant are still in operation. Of all the Amish communities, which would you suggest we visit? Everybody suggests Holmes Co in OH, and Lancaster Co in PA, ut I want to stay in KY and visit our own. Can you help? Of all the Amish communities, which would you suggest we visit? Everybody suggests Holmes Co in OH, and Lancaster Co in PA, but I want to stay in KY and visit our own. Can you help? I have Amish crafted leather belts and hickory rocking chairs for sale. Perfect for Purposeful Christmas gifts! About 20 Amish families in Marion Co and another 30 families in adjoining Washington Co. Carpenters available from both counties. Hello. Just need to know if there are any Amish roofers, contractors near Lebanon, KY.? Need to hire help with roof leaks and other odd jobs? Thanks! Hi! My husband and I will be traveling through Marion Co., KY in the next few days. The last time we were through that area, we visited a Yoder’s Bulk Food Store (grocery store). We would like to go there again while in the area. Can anyone tell me where the store is located? We just happened upon it the last time and don’t know if we can find it again. Thanks for your help. The only Amish settlement I know of in Marion County is at Gravel Switch, in the eastern part of the county, though there may be other settlements there. I have never been to Gravel Switch, but I have heard there are Amish living in the Riley Road area, which is about 9 miles east of Lebanon, Ky., right off Hwy 68. You might also go 3 miles further east from Riley Road to Gravel Switch and ask someone in Gravel Switch where Yoder’s store is. Hope this helps. Several years ago I went to Crab Orchard, Kentucky and bought apples and peaches from an Amish farm. I can not remember the name of the place! The lady that had told me about the place is no longer with us. If anyone could help me with what the name of the place may be I’d greatly appreciate it! Thanks! Barn removal and quality horse hay? I’m looking for someone to take a barn down and possibly buy it or rebuild it to fit our needs? Also looking for high quality horse hay. ? Thank you to all. What area of Ky. is the barn in? I read in the June 14 edition of The Budget about a new Amish community that is developing. It is in Greenup, Kentucky, which is in the extreme northeastern part of Ky. on the Ky./Ohio border. As of now, there should be four Amish families there. Two families moved there in Feb., one family in March, and one family in June. It seems like Amish from Columbia, Ky., are the ones beginning that community. Do you know if the Amish in Greenup Co Kentucky are still residing there. I am interested in finding produce for sale. Your post was from 2017 and now it is June 2018.. Greenup County is one county over from myself. Thanks for any input. I have not been to the Greenup Amish settlement, but I know it is still very much there since a scribe from that community continues to regularly send in news to The Budget newspaper. In the June 13 edition, they mentioned about a new family who has recently moved to the community. I don’t know any specifics about anyone selling produce, but I think it’s worth a visit to check it out. I was wondering if it is at all possible to stay for a weekend with my husband and a 2 year old daughter at one of the Amish families somewhere in KY. We would love to volunteer and help them with their daily activities, yard work, cleaning, cooking, laundry or whatever else is needed. I feel very tired of this lifestyle we live in today. We would love to get to know the Amish people, and experience their daily life, their culture and traditions, and we would love my daughter to be part of it as I know she will absolutely enjoy that too. Thank you in advance. P.S we do own a house in Louisville KY, and both my husband and I have jobs :)just did not want anyone to be concerned that we are trying to find a shelter :)Thanks!! reply to "would love to stay with Amish family to experience culture"
I have seen a sign on the right side of the road as we go south on KY 39 from Lancaster towards KY 150 to Mt. Vernon that says “quilting…” I can’t remember details of the sign. I can find no listings for it. Any information I can pass onto a friend will be helpful. Looking for Amish person to do remodeling at my home. Sooner than later. Need estimate. Looking for a map of this loop, any suggestions greatly appreciated! From Munfordville, take Ky 88 (Cub Run Hwy) west to Cub Run. In Cub Run at the main intersection, turn right on Priceville Rd/Ky 728. The road goes north, then loops to the right/east to Priceville. At Priceville, take Raider Hollow Road/Ky-1140 back to Munfordville. This is a beautiful ride, especially in the spring and fall. Very hilly in several spots. Drive slowly, as there are no buggy lanes, and you can come upon a buggy before you know it. There are many small Amish farms on either side of the main highways and several stops I would suggest — Anna’s Jams and Jellies at 1985 Logsdon Valley Road, Miller’s Greenhouse and Furniture at 2375 Macon-Kessinger Road and Detweiler’s Country Store at 12825 Priceville Road. There is also an Amish hardware store at the main intersection in Cub Run. I consider the Munfordville Amish settlement to be very spread out. There is what I call the main part (which is the “loop” I outlined above). This is all north of the Green River, west of I-65. Then there is another part east and south of Munfordville, focusing on the Rowletts area. (Two interesting stops in that part are Abe’s Place (Amish Consignment Shop) at 2915 S. Dixie Hwy, and R & S Grocery and Bakery on 235 Irvin Cemetery Road (off Dixie Hwy, south of Munfordville). The other part of the settlement is south of the Green River (west of I-65) that you get to by going west from Rowletts on Rowletts Cave Spring Road. I hope you enjoy your drive through the Munfordville settlement. Al, thanks very much for the valuable information. We plan to stay a few days in Munfordville. Referring to Al in Ky notes Miller’s Greenhouse and Furniture at 2375 Macon-Kessinger Road does not sell/build furniture anymore. His nephew Andrew Miller has taken over the business. His address is Miller wood products, 1535 cherry springs rd, cub run, ky 42729. ph 270 524 5718. Andrew build custom doors, cabinets and furniture from reclaimed barnwood. He also sells furniture from Amish furniture makers in OH. He has a small building stocking a few items and has got a whole bunch of catalogs. We purchased custom furniture thru him. I compared prices with a number of sellers and online places and he was 10-20% cheaper. I agree with the loop Al suggested it is very pretty country drive. We also went to the R&S Bakery & Grocery. Their pecan pie was delicious as well a their donuts and other bakery goodies. Thanks Mathews for posting this update re: Miller’s Furniture. I had last been to Millers on Macon-Kessinger Road in April 2017 so appreciate the update they no longer sell furniture. I’ll be going back to the Munfordville area this spring, so will be interested in visiting at Andrew Miller’s Wood Products. I don’t have any specific information about an Amish metal roofer, but I do have a suggestion. I think the Amish settlement at Crab Orchard, Ky., may be the closest one to Nicholasville. 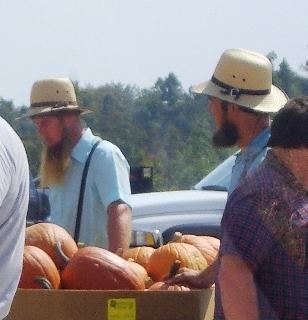 They have a good Amish produce auction there which is supported by many Amish in that community. You might try calling the auction and leaving a message about your need for a roofer and see if you get a response. The phone number is 606-355-0030. Or, if you have time, you might go to an auction and talk with some of the people at the auction. The auctions are held on Mondays at 1 p.m., and Wednesdays and Fridays at 11 a.m. The address is 2896 Ky Hwy 39 N., Crab Orchard, Ky. I think you may have misspelled his last name. It should probably be Christner. Are there any Amish house painters in the Louisville KY area? Please respond via my email address. Amish Barn Builder in St Charles, Kentucky near Nortonville area. I am purchasing a 40’X 40′ Wood Barn from Sand and Creek Barn Company. I am need of a Amish Barn Builder who can erect the barn for me. It will be out in the country and have no power.